What the heck is Steampunk? And, why is it such a cool idea for a wedding? 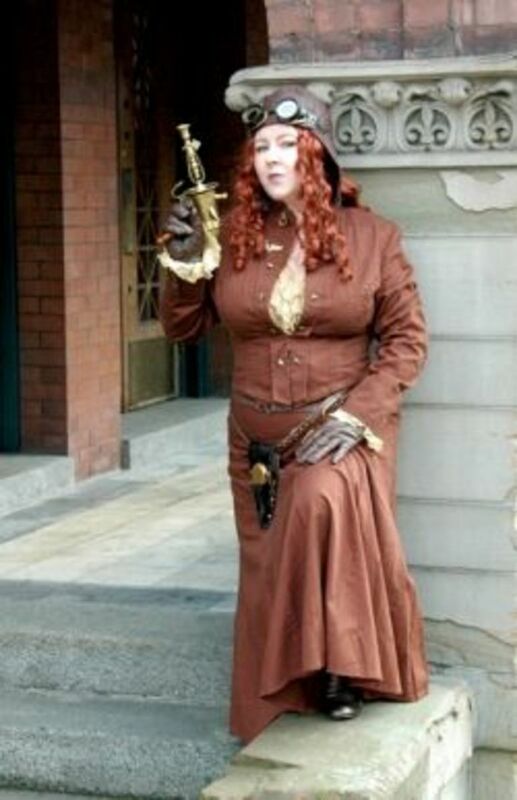 Some say Steampunk is a sub-culture genre that mixes Science Fiction with Victorian era fashion. It can look a bit post-apocalyptic, and then again, it's also kind of futuristic... It's a world filled with sepia tones fused with rich jewel colored accessories, lots of bronze, brass and copper, with shapes of cogs and vintage typewriter keys. 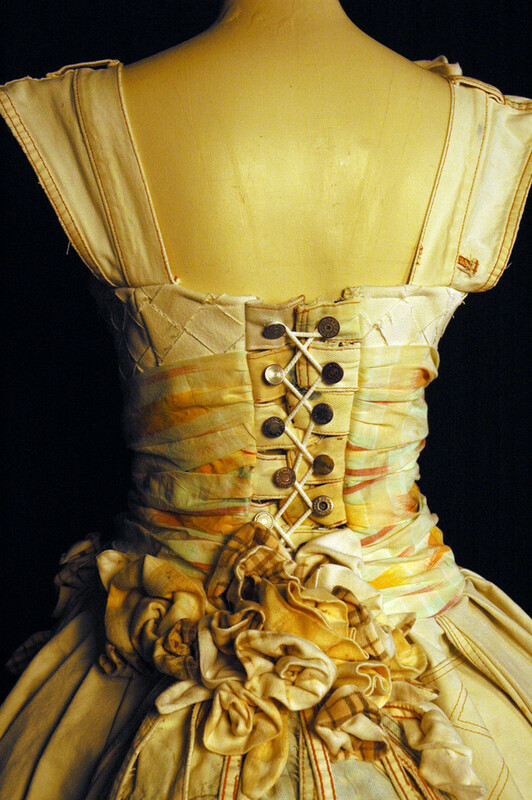 Fashions include plenty of lace-ups, corsets, buckles, hats, goggles, stripes and crinolines. It's environmentally friendly, in that so much of the essence of this movement is to recycle goods that already exist. 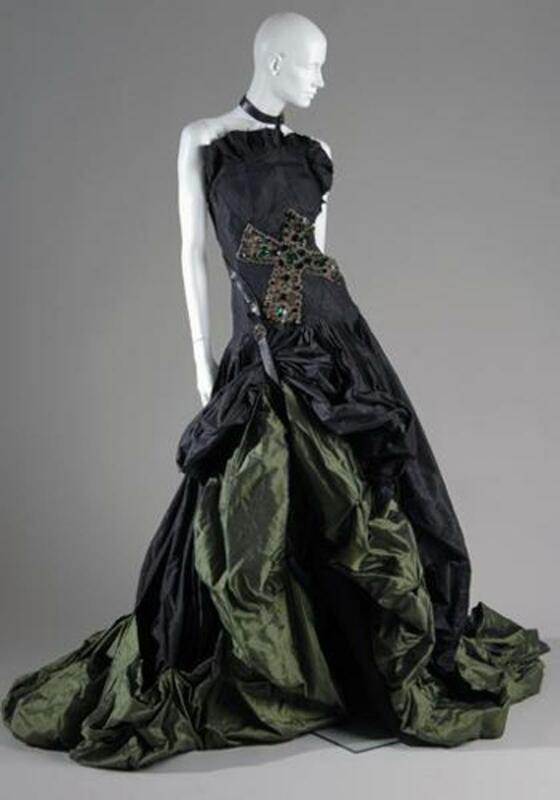 Designers deconstruct materials such as blue jeans and pillows and reconstruct them into another world of couture fashion. A few movies that may help orientate you into this world are Chitty Chitty Bang Bang, Around The World in 80 Days, City of Lost Children. Though, I personally feel that Darth Vador, though not as fashionable in a neo-Victorian sense, tends to be a bit Steampunk himself. 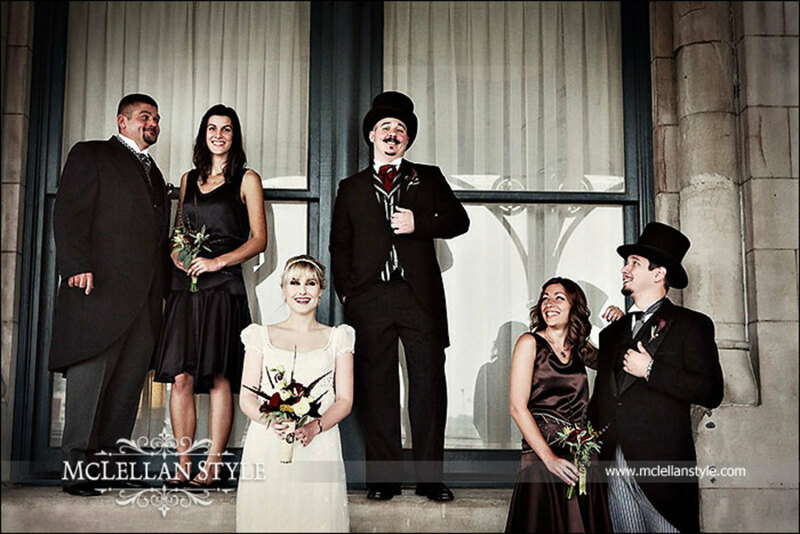 Though, Steampunk is a way of life for many, it can also be a thematic wedding party for those interested in a time period where nostalgia meets the future. Though some people feel the visuals are a bit dark and dingy for a wedding, consider many of the top fashion designers have created gowns and suits that run well into the thousands of dollars, while fusing intricate craftsmenship into their works of art. Steampunk isn't just a counterculture, it a land of artwork. 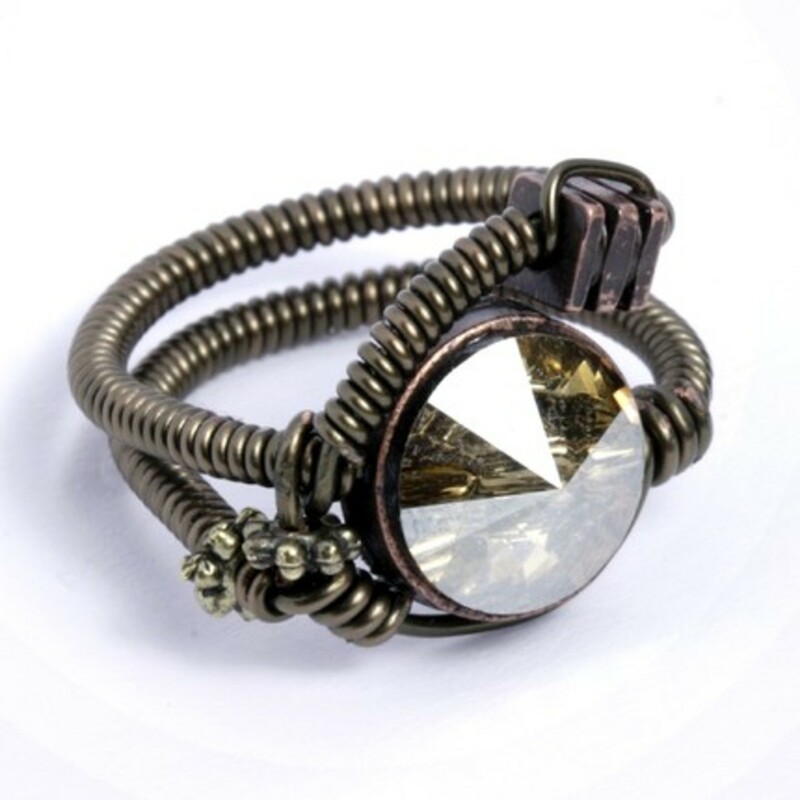 Each item created in the world of Steampunk, is original and one-of-a-kind. There is no mass production line creating products from this visual genre. Instead, each dress, boot, hat and cravat is created by someone's hand. Attention is paid to the details. I would venture to say that many of these items are better made and higher quality than most items sold off the rack in a store. Of course, it all comes down to taste. 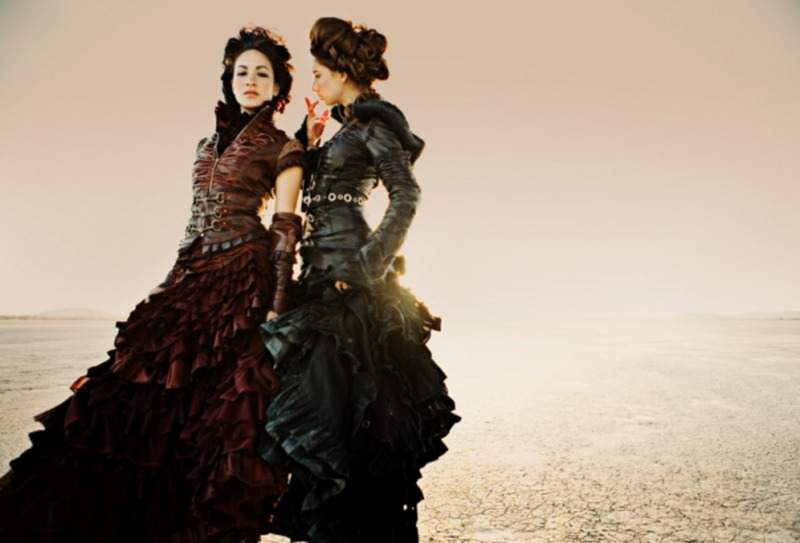 I think there is an easy way to make Steampunk either "dressed down" so it is a bit dingy looking, or to "dress it up" and make it very couture to appear as if you are in a historical film. It is a funky world. It's a more playful version of Gothic, and it's visually cleaner than a lot of punk. Perhaps it's more developed with class and style; refined and elegant. 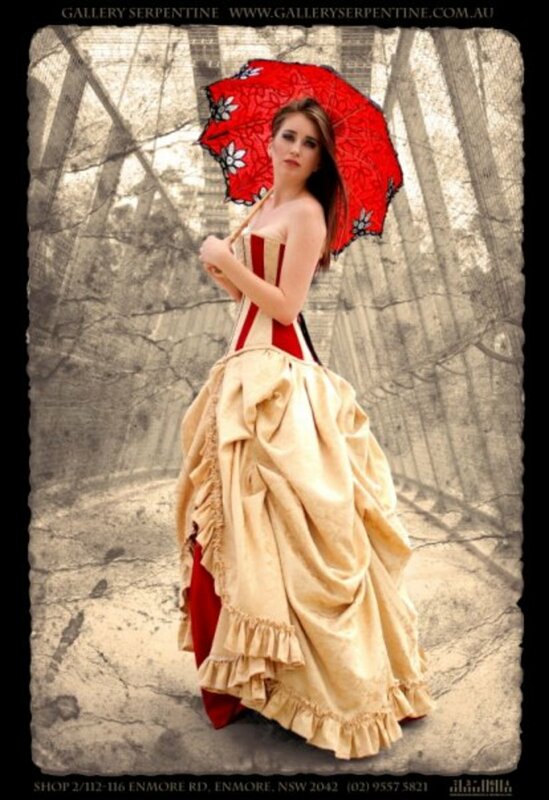 Dresses from the Victorian era lend themselves to a particular type of class. A time period when manners were important, and people had more time. While planning your wedding, it is possible through internet vendors and some ingenuity to create your own Steampunk theme. Many craftspeople on Etsy, specialize in making dresses, suits and accessories for your entire wedding party. They also personalize each order if you have a specific color theme in mind. I've also found their custom made work is actually cheaper than many store-bought dresses of similar quality. 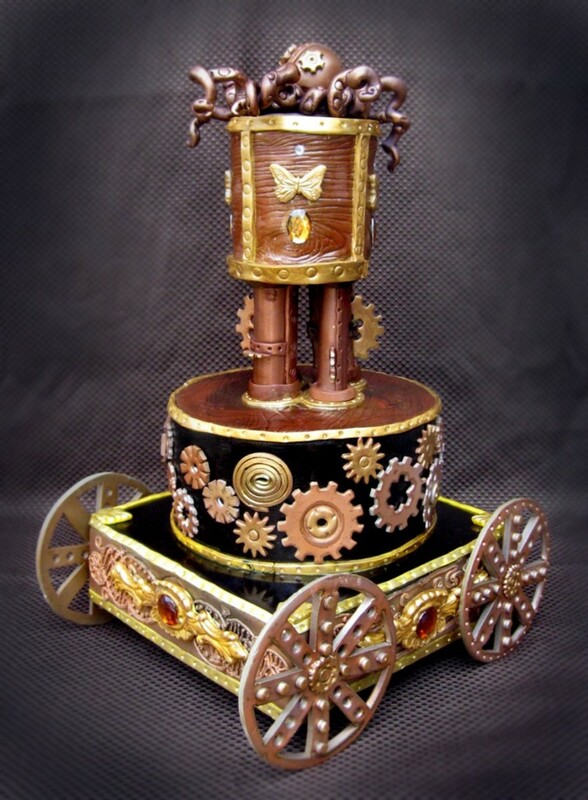 There are many more photographs that I wanted to include in this article, such as an array of Steampunk wedding cakes that have secret doors of fondant icing that open up into cogs. Or, wedding invitations that appear to be from the Victorian era with printing reminiscent of old carnivals with fire eaters and tattooed ladies. I may have to create another article on just wedding accessories. It is more difficult to find flower girl dresses to match the theme. However, you can have a bustle ordered to attach to a typical flower girl dress, or choose a funky-colored dress from the Barbie collection. A good hairstylist helps to finalize the illusion. 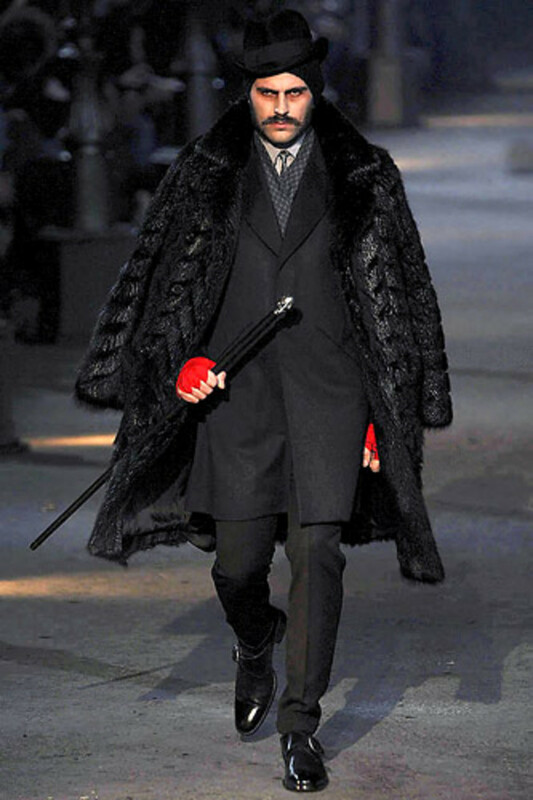 Don't forget black gloves or a little hat with feathers. One thing I don't have pictured here is a Button Bridal Bouquet. 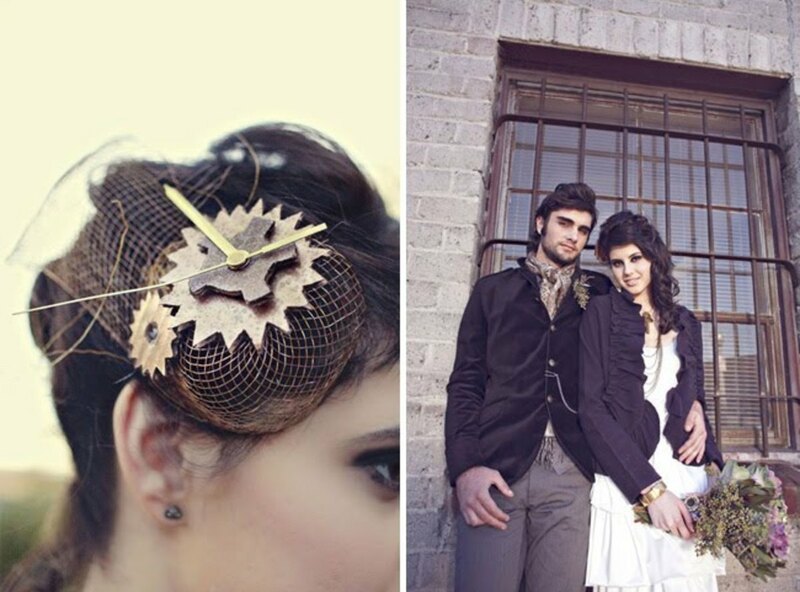 This is worth checking into if you're seriously considering a full-on Steampunk wedding. And, they make great heirlooms. 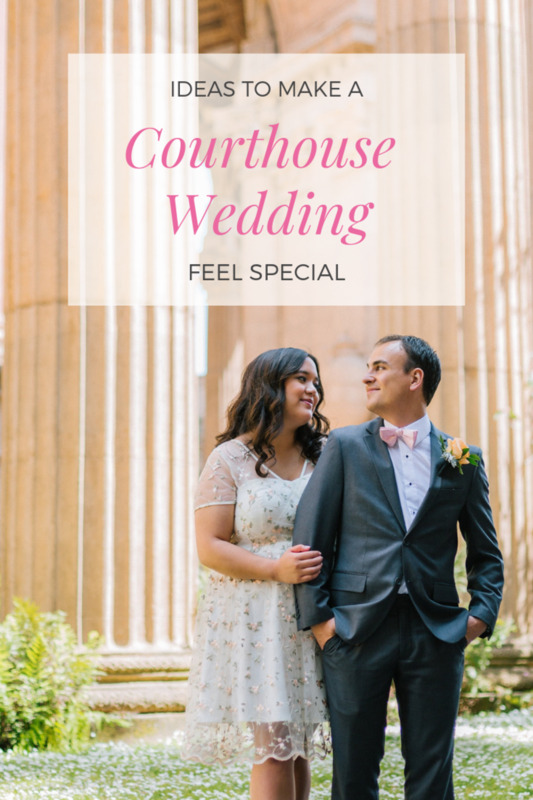 With all of the work put into creating a wedding of this theme, a wedding photographer is very important to capture all of the details of the special day. Find one that has a knack for visual art, not just documentation. You'll also want to find a location that suits the theme. One idea for those who may be in Virginia, is the Edgar Allen Poe Museum. 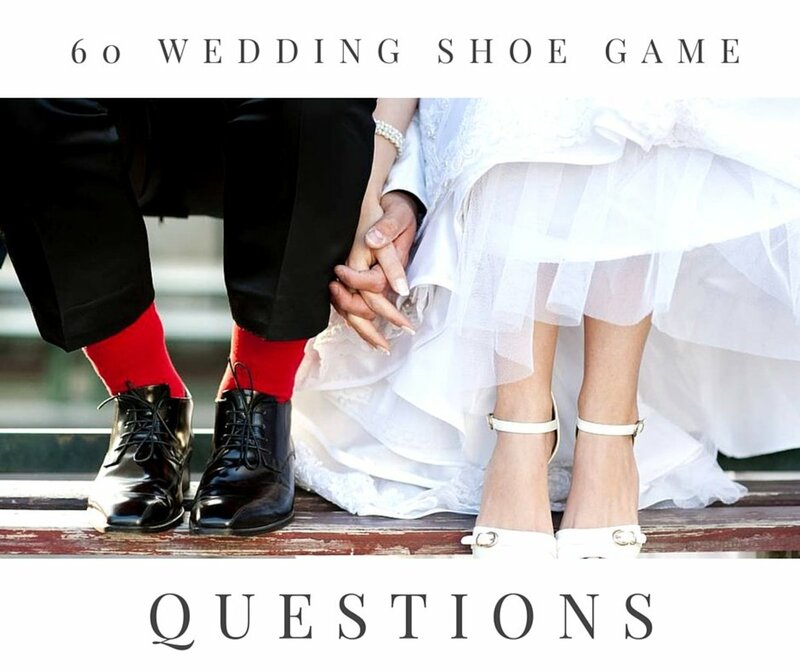 You may also consider asking your guests to dress the part, or at least offer a suggestion for what colors to wear. This way, everyone can participate in your wedding theme. Not only will your day be amazingly beautiful, it will also seem as though everyone celebrating with you has been transported to another place and time. 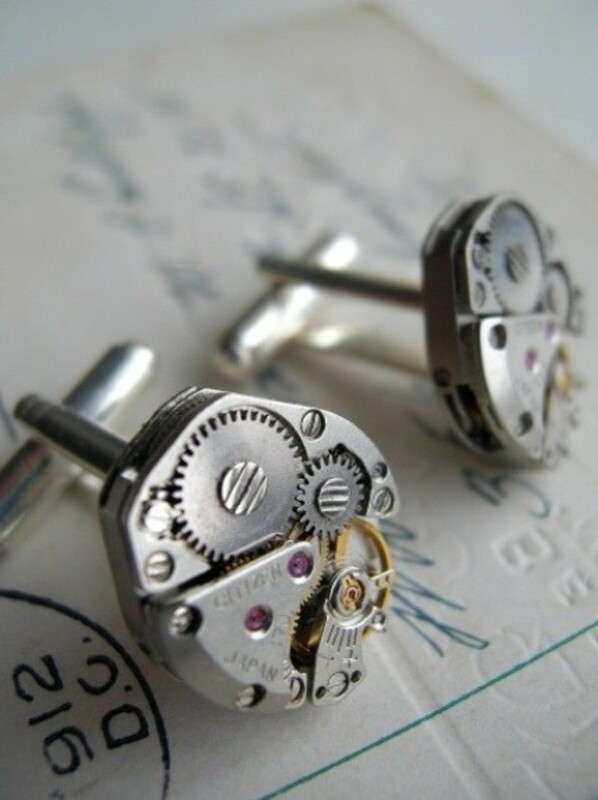 Steampunk Cuff Links - great gifts for the groomsmen! Thumbs-up and awesome. 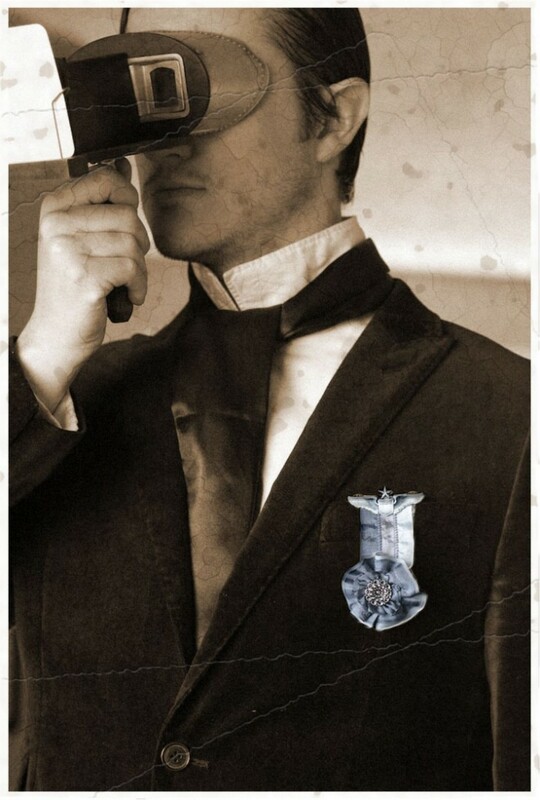 I'm a wedding officiant in South Jersey, and I'm hoping that soon, one of my couples will do a Steampunk theme. I've got my gear ready to go! Martine - Your wedding looked AMAZING!!! How much fun! Thank you so much for the link to the photos. And, congratulations. 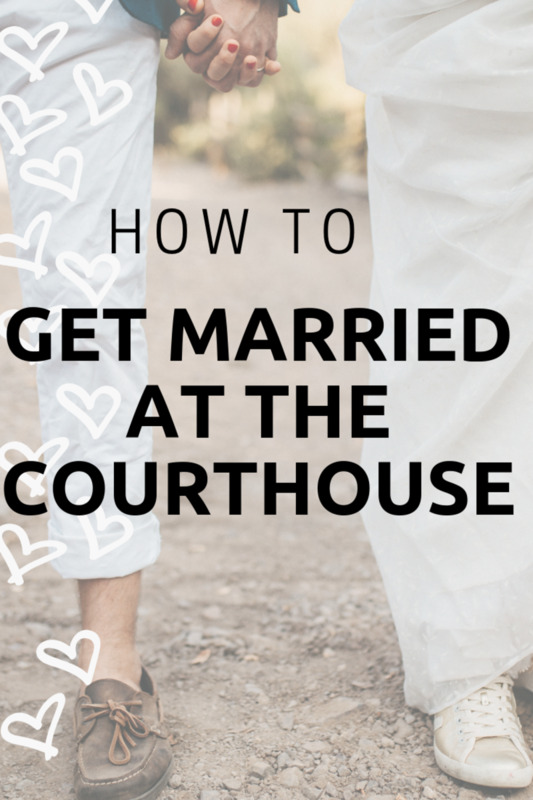 I hope many people see your link and get inspired for their own wedding. That looked awesome! And, I really liked the wooden thumb drive invitations/information - super cool! anjperez - So happy you stopped by! I'm always happy to help provide inspiration! Cheers! i learned something new today. i am glad i came across your hub. i like stuff like these. because my imagination for design (very limited) is widened. i feel cool coz i now know Steampunk. 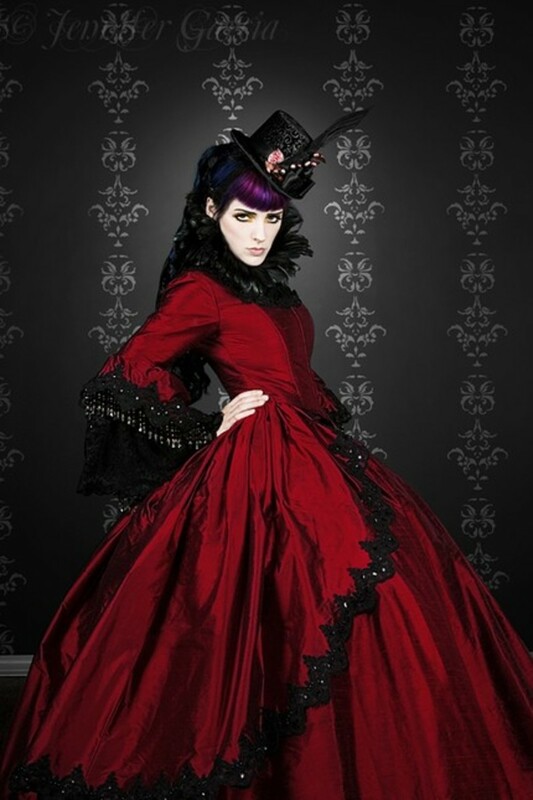 and how it differs from goth or victorian. Hi Dolores, I love the variety too. 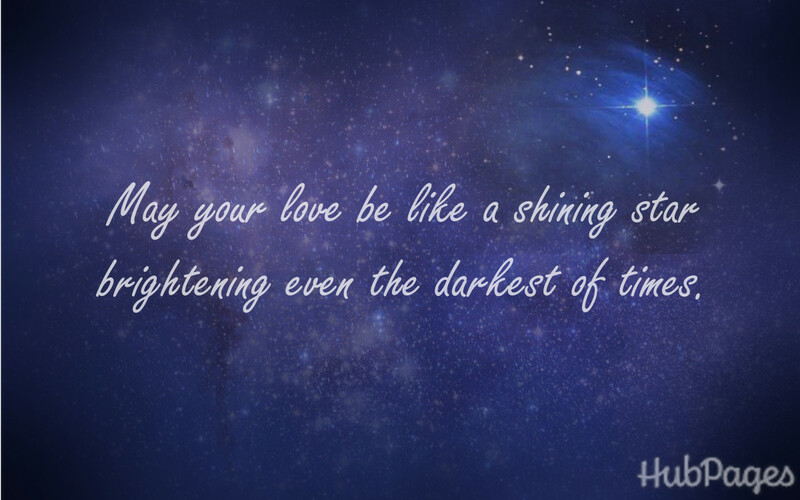 It's romantic and funky. I bet the wedding guests really enjoy dressing up too. I've always thought it'd be fun to have a masquerade ball wedding (or attend one), this is the next best thing. Ashamed to say, I've never read Wuthering Heights, but I bet I'd like the costumes of that time period. Thanks so much for stopping by! Hi K-T-B, I was recently turned onto the concept of Steampunk as well. The first time I heard of it, I thought it was just going to be punk or goth looking (all black with white face make up), I was pleasantly surprised at how wearable it actually is. It's not too far off from being a usable fashion. And, you're totally right - its the Victorian charm that makes it so likeable! Nellieanna - I totally agree with you! How fun is it to create an environment that is the creative world of the participants? It gives the audience better insight into who it is they're celebrating...a little slice of life. I do enjoy creative fashion ideas. My mention of my experience was to point out how far things have progressed. I think my idea of a really wonderful "day" for a wedding, though, is neither the traditional nor the dramatic. 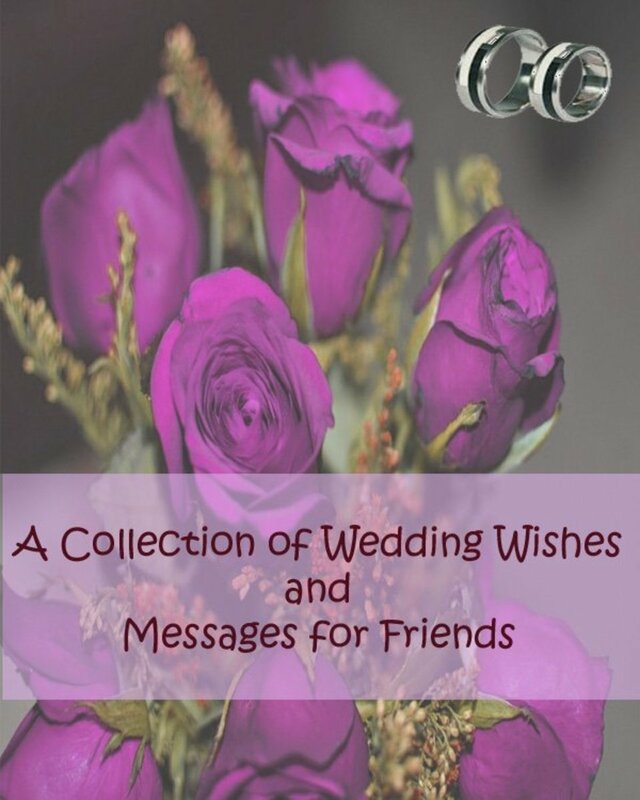 I think a very personal wedding which speaks of the participants more than to the audience is appealing and leave the drama for the trousseau and later extravaganzas! LOL. I love your hub, by the way! I've not heard the term 'Steampunk' before--might add its an unusual concept Victorian +Sci-Fi---its past meets future. 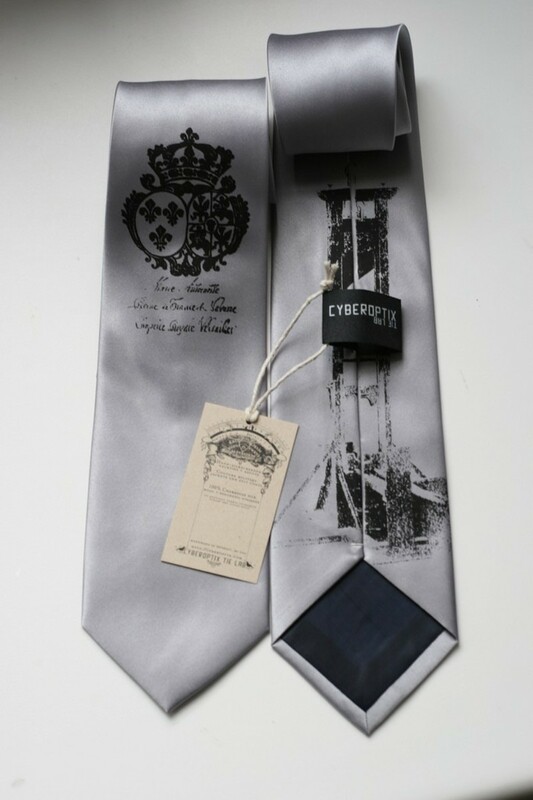 Form the images you have it definitely does look wearable thanks to the Victorian charm. I love the idea of how eclectic brides can be nowadays in every aspect of their wedding. People can really customize their day so it suits their personality. I suppose it's still yet to be seen how photos of unusual wedding days will hold up over time...Though, I bet if I found an old wedding photo from one of my relatives a hundred years ago dressed in these costumes - I'd be seriously impressed...or at least, very entertained! Most interesting. I was a Bridal Consultant on two occasions - one, right out of college and the other, right out of a lengthy not-good marriage. Things have certainly changed!